school, originally uploaded by jahansell. For as long as I've lived in Sharon, the school in the center of town has had a forbidding-looking chain link fence and some dilapidated playground equipment out front. I recently noticed both were gone, and it looks much grander now. Nice picture. That place really does look good. Hard to imagine it the way you described. 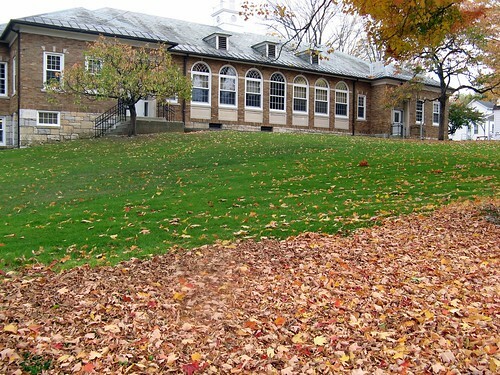 Love the color of the grass, and the leaves, and the brick/stone... very nice. The school looks almost new but from a different era. i think it looks very nice now. must be a very conducive place to study. This is because they got new Playground equipment for the preschool kids. Now around back. Hooray for keeping a building for what it was intended!